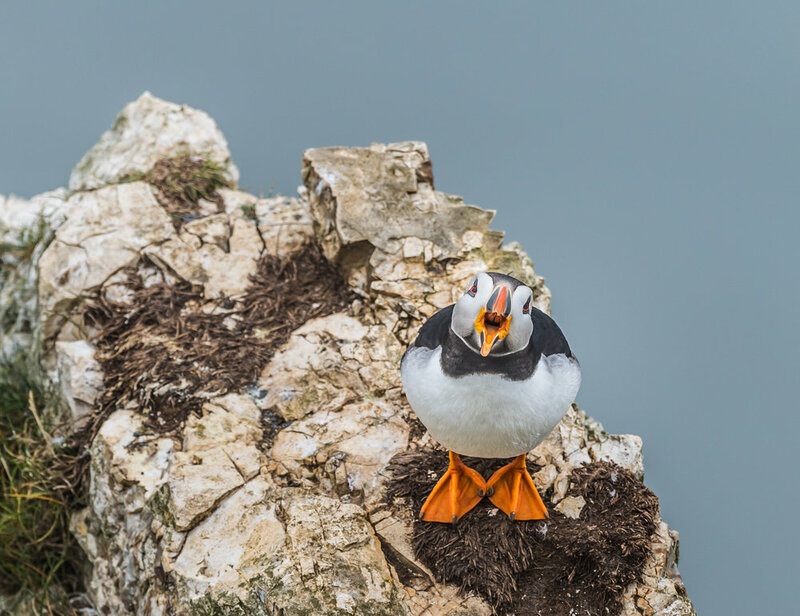 I visited Bridlington for the first time last year, and with the same purpose: photographing puffins at Bempton Cliffs! 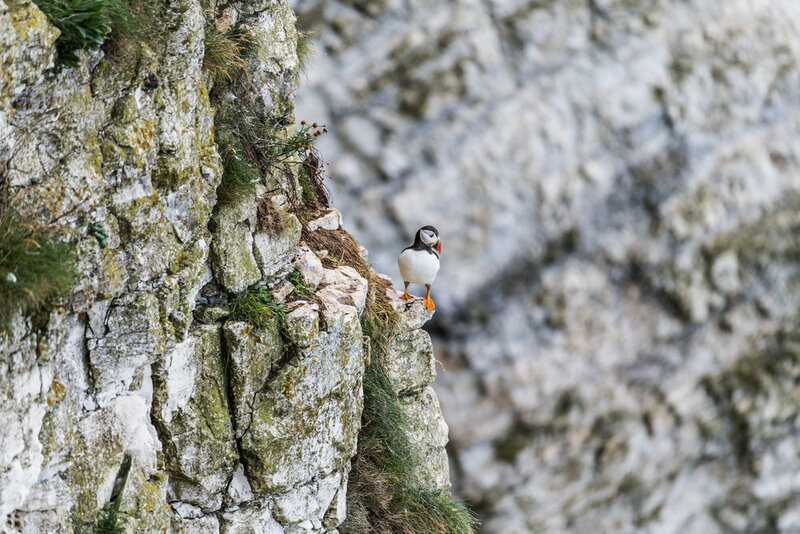 It is not the easiest place where you can do that - because the cliffs are quite steep, and provide an excellent place for puffins to hide, usually in the shadows, making photography almost impossible at times. Why do I choose this place, when there are other places, like Farne Islands in Northumberland or Hermaness and Sumburgh Head, Shetland where you could literally go as close as you want to puffins? I really don’t know. I think to me it is also about the way in which I manage to get close to the birds, understanding their behaviour and habits, and, as with human subjects, creating a magic encounter. And this year, I thought, I am more prepared and more confident that I’ll get the results I want. ABOVE: We were so close and looked into each other eyes, with the same wonder, curiosity and respect. My main concern has been to get closer without disturbing, almost trying to become part of the landscape, giving the birds the respect they deserve for allowing me to step into their personal lives, especially since puffins are known to be pretty shy creatures. ABOVE: The puffins don’t seem bothered by the sea fog. So why should I be? I continued shooting. There are times when weather is a challenge, too. If it is not rain, then it might be sea fog which engulfs everything around, making focusing difficult, and, indeed, you can’t see anything anymore. But I guess I took this as yet another challenge, and did not stop shooting. Although not very clear, I like the photos of the birds in the mist because of the context they offer, and, oh, well, because they are different. I’ve seen many amazing close-up portraits of puffins, and I took some great ones. Somehow, I still love more the behaviour shots, and I find them also hard to capture. As with everything, the more you insist, the better the photos. The light changes, and then, for a few moments, you have exactly what you wanted, and the magic happens. I love this photograph because it preserves the warm glow of the sun, and it also shows the puffin caught in ‘action’. ABOVE: Last meal before leaving. I must admit I would have wanted to do better in photographing the puffins in flight with little fishes in their beaks. It was, however, very problematic, as most of the birds already left, and, there were a few hours when there were no puffins in sight. I must admit I was sad and desperate, at the same time. I knew I should have come weeks before if I wanted to capture the ‘buzz’ of puffin parents coming back to the nest with food for the little ones. However, I managed to get some shots that I am pleased with. ABOVE: See you again next year! For the second time photographing these amazing birds in such a difficult and challenging location, I think I did okay-ish. I am not a bird photographer by any means and, apart from puffins, I don’t photograph any other birds - at least not with great intent. I read many articles on bird photography and watched a few tutorials. But probably the most valuable information I found was through practice - things I needed to know about puffins and about my camera and me. The photos are dear testimonies of a special encounter that I cherish until we’ll see again next year.